Get ready to dive in with all your friends! 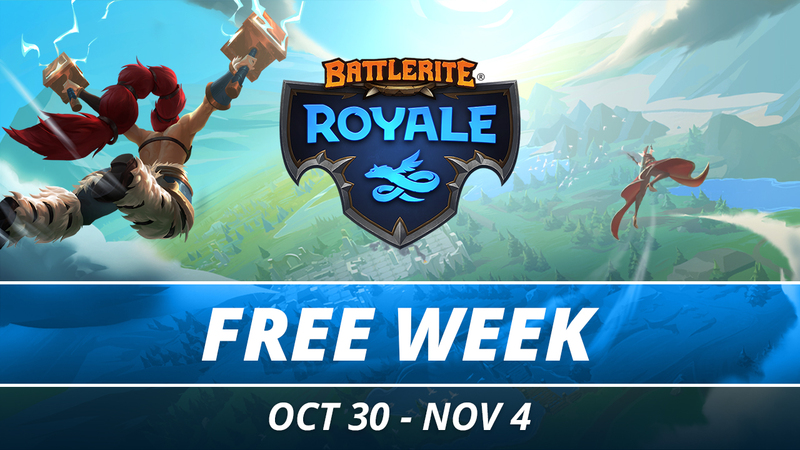 This week from October 30th until November 4th, Battlerite Royale will be free to play and try out as part of Midweek Madness! If you like what you see, you’re in luck! Take advantage of the 30% off sale that will be going on at the same time. But that’s not all that’s going on this week, there’s more! Besides the Event Quests for Curse of the Night, a new quest has appeared! Play one Duo match and take home an extra Silver Chest, on us! Looking for a way to get your hands on Battlerite Royale? Take part in the Gleam campaign for a chance to be one of 25 people taking home a Battlerite Royale EA key and 2 Gold Chests! Log in during Free Week and you may find you receive a little extra something something on us!